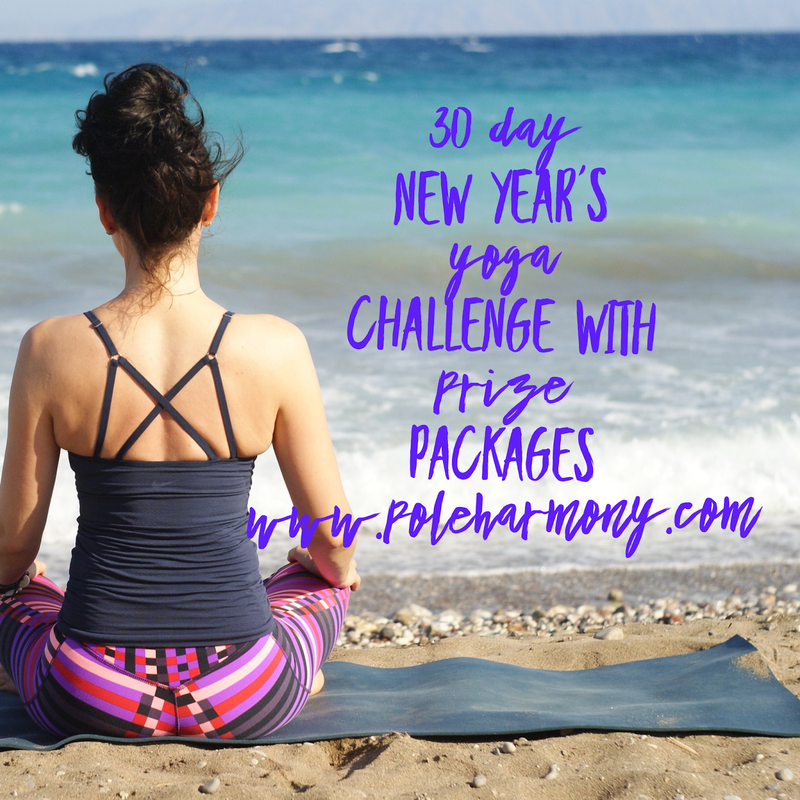 My favorite online yoga class streaming service DoYogawithMe.com is offering 30 day Yoga Challenge where participants will have the chance to win one of three gift baskets in the month of January! 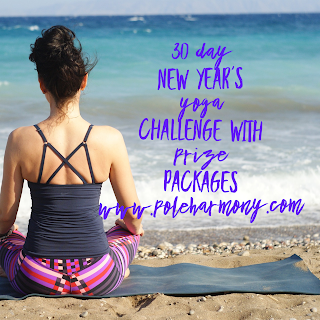 To participate, check out their details on each of the gift baskets and click the level of your choice for how to get started with the 30 Day Challenge. Challenges will be live on December 31st. It's been awhile since I last posted! I hadn't realized how much time has gone by. So where have I been? Pregnant! I'm 8.5 months as I write this blog entry. It's been a crazy busy past few months with appointments, organizing, and fitting in my workouts while growing a tiny human. I withheld telling anyone until I was about 22 weeks when I decided to let my sister in law host a baby shower. I had previously decided not to go the traditional celebratory route until after baby was born but am glad we were able to share this long awaited news with our close family and friends and celebrate at an event. I've had a lot of time for self care and have shifted my workouts to a home based buddy circuit with my husband. I'd like to share some gift ideas for my annual holiday gift list. 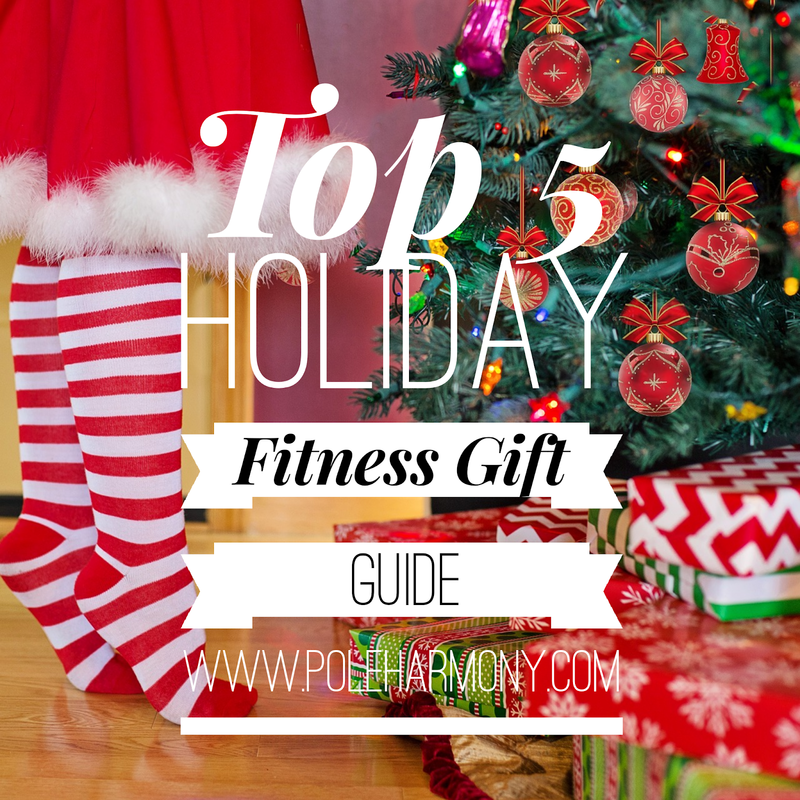 While it may not be aerialist or pole dancing specific this year, I think it works well for those looking for a well rounded fitness themed guide. I have incorporated a Pilates Ring into my workouts this past year and I must say - I LOVE the versatility of this thing! My favorite target areas have been glutes, thighs, and abs; which a Pilates Ring does a great job at getting to that workout burn we all know and love from those Barre classes. This item is a definite NEED for all fitness areas. 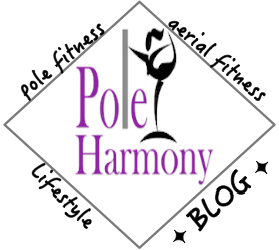 I used mine religiously for pole, aerial, and now in pregnancy. The one I choose from Amazon is a 2-in-1 13" with carrying case which is perfect for on the go. I'm adding this to my hospital bag as a must have labor support item. For regular fitness uses, the foam roller has become a staple among those in the aerial and dance apparatus fitness disciplines as it helps relieve muscle tightness all while incorporating necessary injury prevention. Bath and Body Works has an amazing Aromatherapy line with Spearmint and Eucalyptus scented Stress Relief products. Ideal to burn on your rest days to soak up some relaxation or during a deep stretch session. This candle is an immediate self care win. Still on the Spearmint and Eucalyptus bandwagon here but these Bath and Body Works in shower steamers are the perfect gift item that can be used post workout, when you're feeling under the weather, or as a Sunday Spa day relaxation prep for the upcoming week. Other scents available include Energy Blend of orange and ginger, Comfort Blend of vanilla and patchouli, and Sleep Blend of lavender and cedarwood. I feel like 2018 was really the year of implementing resistance bands in our pre and post-class conditioning at the Circus gym. Since I have been on a teaching break due to pregnancy, I have fallen in love all over again with my bands for my at home pregnancy workouts. I have been really enjoying the on the go versatile fitness gadgets that target multiple areas of the body lately. I've used my bands at work while sitting at my desk and in the car during an eleven hour trip to keep my body moving and to ward off pregnancy related restless legs. 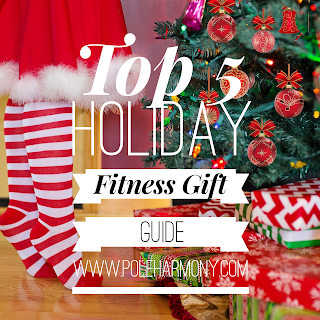 This kit is an ideal stocking stuffer for your favorite fitness enthusiast. There you have it, my top 5 favorites from the past year. I hope everyone has a wonderful holiday season and a Happy 2019! I've been hearing a lot about switching your deodorant to a natural formula lately. I decided it was time to look more into products that fall into the classification of natural versus my long time use of commercialized mainstream deodorant I've been using since I was twelve years old. So what is the real concern about my trusty deodorant that prompted me to seek change? I've heard a lot of rumors about specific ingredients within deodorant not being very healthy. These ingredients are aluminum and parabens. Parabens have been linked to cancers while aluminum has been suspected of being linked to cancer. There haven't been any substantial studies that have proved the theories of these ingredients being directly related to causing cancer from a deodorant (Antiperspirants Safety: Should You Sweat it?). While there isn't a definitive word on whether or not these products cause harmful affects to your health, it hasn't kept people from opting to make changes in their hygienic products. I decided to try out a new deodorant and see if there was an advantage to me using something that is marketed as being "more natural." I found Tom's of Maine Wild Lavender deodorant to smell the most pleasing to me. The deodorant smells really good when first applied and the fragrance dissipates after a couple hours. The formula is clear and goes on slightly sticky. The odor control is not the best as I notice some break through odor. The product does not leave a thick residue after showering which is something I have noticed with my previous aluminum containing deodorant. To combat the break through odor, it has been suggested to do an armpit detox treatment. 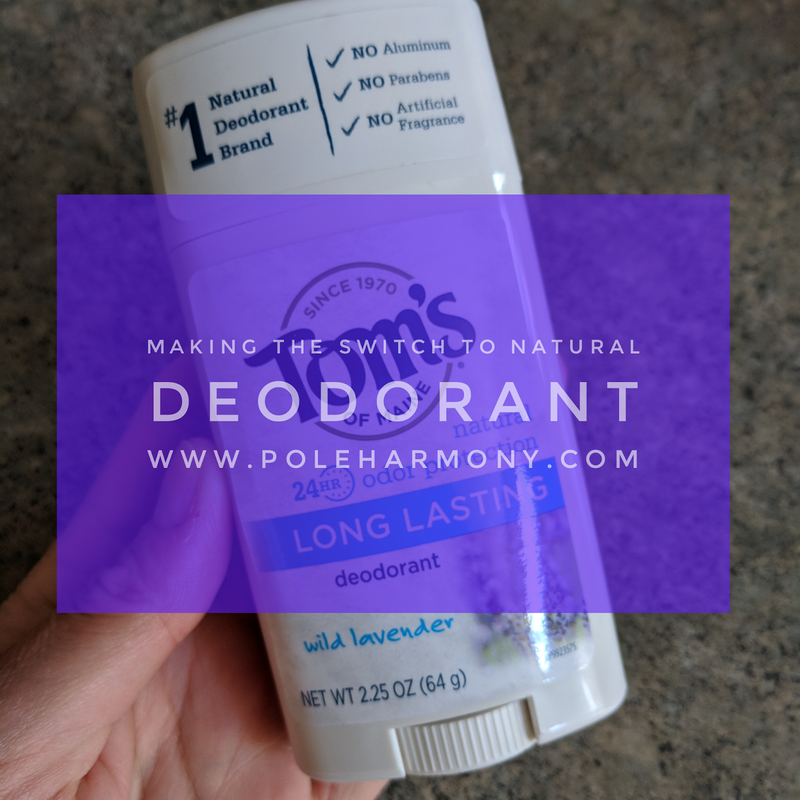 A friend of mine shared an article with me on how to detox your armpits when switching to a natural deodorant. The detox claims to help pull out the odor blocking chemicals that are found within aluminum containing deodorants. These chemicals work to block sweat ducts and prevent perspiration. I haven't tried the detox because I feel like I'm not having an overly noticeable issue with the break through odor. It's mainly at the end of the day when I notice it and by that time I am already getting ready for bed. So far the deodorant seems to withstand my aerial workouts especially when adding another application prior to the work out. I've decided to continue using the natural deodorant and see how it holds up over time with continued use. Have you made the switch to a more natural deodorant? Please feel free to comment about your experience or favorite brands below. Pure Barre offers an online streaming membership for $29.99/month. Your first week is free. With Pure Barre On Demand, you get 24/7 access to a variety of workouts that are categorized as full body, core, lower body, upper body, or a designated time frame to fit your at home workout schedule. The Pure Barre On Demand service also allows users full access to all the Pure Barre DVDs. On Demand offers a free intro class that is a 52 minute video where the first 5 minutes is talking about the concept of the method followed by technique and their own specific language terms used during their workouts. The actual introductory workout starts at 5:00 on the video. I highly recommend viewing this video and giving it a try if you're curious about starting this style of workout in the studio or at home. This intro class is very similar to the classes I have taken at the studio. Sometimes the live classes can be quick and difficult to grasp essential form technique. After watching this video, I feel like I have a better understanding of some of the things I need to be doing better in each of the exercises I have done in my live classes. My On Demand experience has been very positive so far. I have been using the On Demand classes for two weeks now. 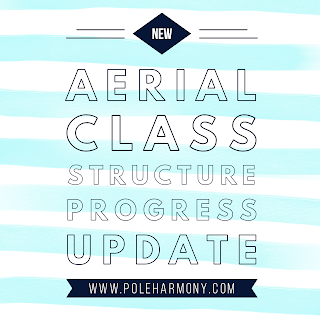 The majority of the classes utilize a wall for support, mat, and/or the double tube resistance band. I was hoping more classes used the mini ball as a prop since I really enjoy using mine in my workouts. (I love props when working out). Speaking of props, I have also used my Lebert Equilizer Bars in place of the wall when I need a little more stability. You can also use a chair as a support if you don't have a barre or suitable wall space. price - a single class at my local studio is $24 or $99/month unlimited. On Demand classes are unlimited $29.99/month. As you can see, the pros far outweigh the cons list for the On Demand. While this may not be preferable for some people, I personally really enjoy making use of online classes. I have been a long time supporter of the online yoga and Pilates classes offered with www.DoYogawithMe.com so I am accustomed to motivating myself to the online workouts. If anything, I highly recommend the free online intro class for Pure Barre as it gives you an idea of what to expect during a live in studio class if you're wanting to jump on the barre workout bandwagon. 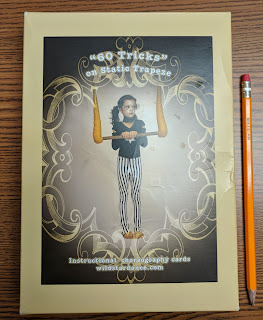 If you're a regular reader then you are well aware that I have decided to dive into learning the static trapeze. 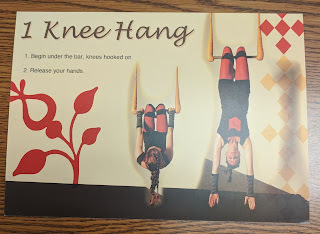 I recently wrote a blog about my intro to the trapeze apparatus. 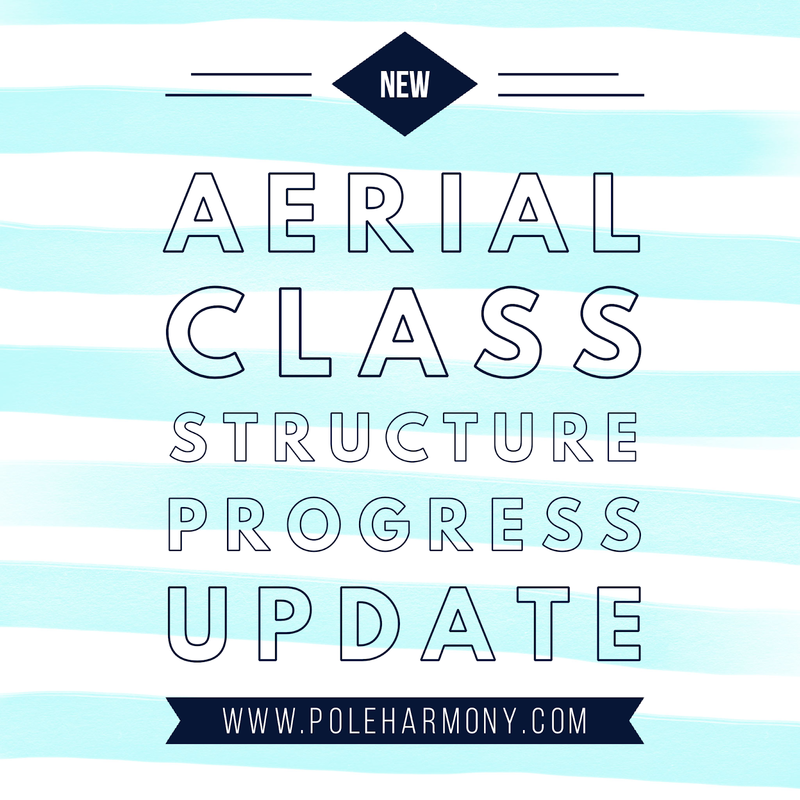 I wanted to touch base with my readers about how I was coming along in my progress and discuss some learning tools I have incorporated into my training. My second session on the trapeze was more of me testing my aerial body awareness and transitioning some moves I already felt comfortable with on other apparatuses. Since I have a strong base for some movement that would translate well to the trapeze, I ended up putting together a short routine of moves that I could focus on cleaning up with more practice and piecing together into a performance for an upcoming student/instructor showcase at Cirque Indy. Unfortunately a few days after this intense and successful trapeze session, the weather drastically changed from warm to near freezing. My left trapezoid and neck area stiffened up and put me out of commission for the next week. I couldn't attribute the pain to anything physical and my husband was complaining of the same symptoms so I assumed I must have had a virus. Once my neck issue resolved, I was back at it in the air trying to make up for lost time. 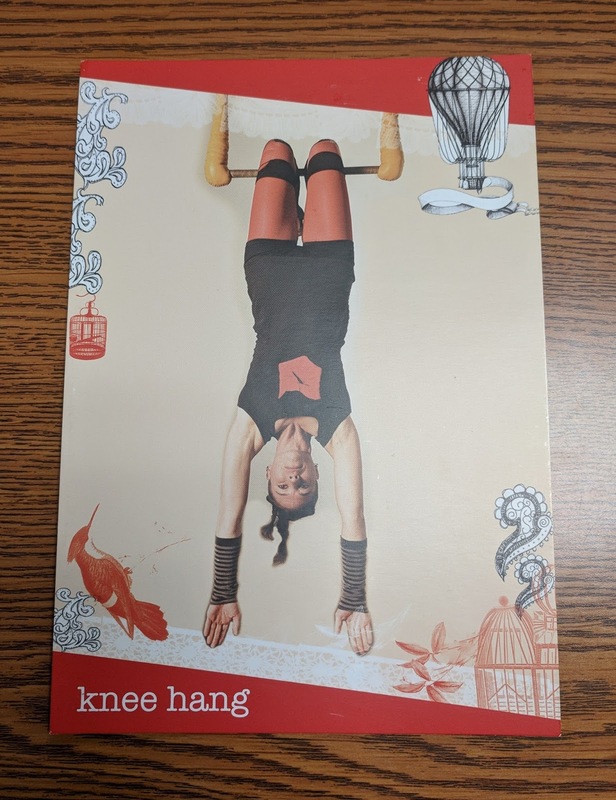 Lucky for me, by this time I had received my latest edition to my growing library of aerial material, Trapeze style flashcards. 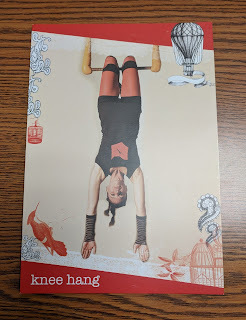 In an effort to expand my training, I purchased the 60 Tricks on Static Trapeze Choreography and Instructional Cards from AerialDancing.com. Please take note that if you're a beginner then these cards are not intended to supplement the expertise and instructional aspects of a true aerial instructor. I have been training on multiple aerial apparatuses for nine years and have the ability to train in the presence of fellow qualified aerial instructors. I do not recommend anyone using any printed manuals or tools as a single means of learning aerial techniques or as their only informational training device. With that said, let's talk about the cards! The cards arrived well packaged via USPS carrier. My initial reaction of the cards were that they are quite large, measuring 8 1/2" x 5 3/4". They come in a cardboard tuck box with an eight page well written instructional booklet. The tuck box was flimsy and the corners tore right away. I ended up reinforcing the corners of the box with tape. I may eventually have to move the cards to a large ziplock bag in place of the box as I anticipate the box not withstanding many trips to and from the gym. 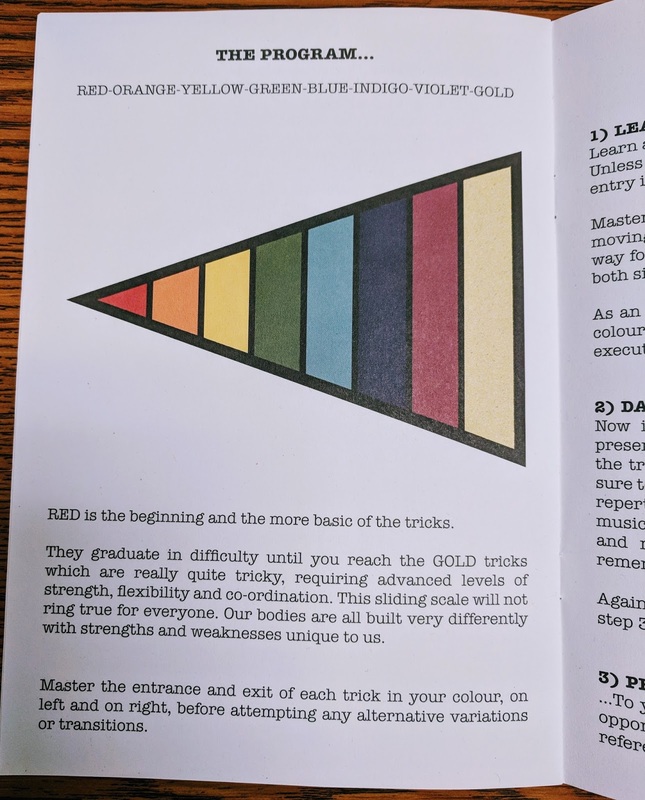 The booklet covers basic information about getting started and using the card color coded system. 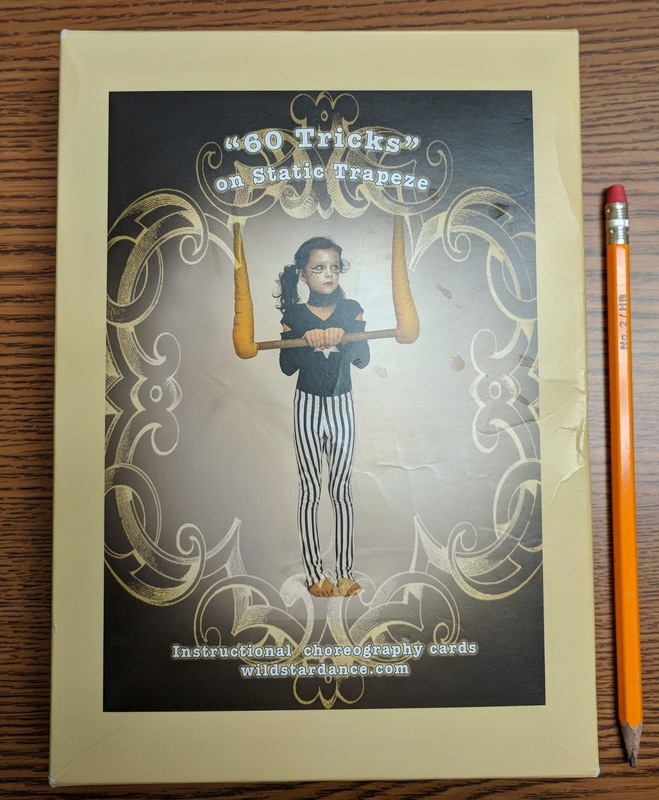 The book further talks about some tips to remember when working with Trapeze as well as three basic transitions that should be mastered prior to attempting any of the tricks displayed on the cards. includes a step by step instruction plus pictures to execute the move. The cards cost me $89 plus shipping. After having the cards in my possession and working with them, I feel this price point is fairly priced for this item. Yes, they work! I love these cards. I have been working with them consistently to supplement my training. 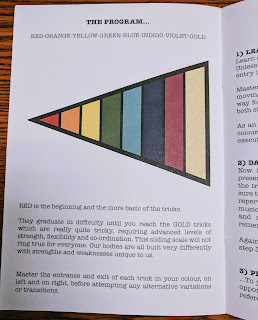 The color coded system that ranks moves on levels has been one of my favorite attributes as it allows me to set aside certain skills until I have completed the cards that precede it. My initial use of the cards is skills focused. I hope to progress and utilize these cards to create choreography in the near future as I plan to work towards performing in upcoming showcases.